Dedication Weekend, September 27-28, 2003! 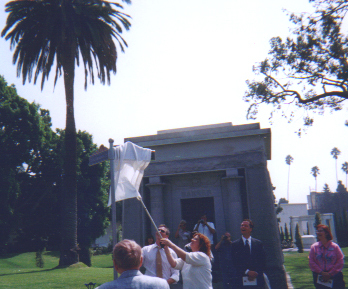 Note: Nelson Eddy Drive is located at Hollywood Forever Cemetery, the street nearest Nelson’s grave. 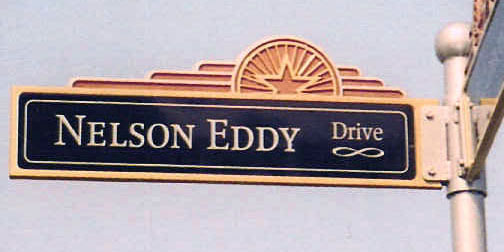 The Mac/Eddy Club officially sponsored the purchase of this first celebrity-named street as part of the fundraising for the cemetery which previously had fallen into disrepair. It was purchased by new owners and lovingly renovated into the showcase of Hollywood history that it is today. Well, folks, it was everything we had dreamed of…and more! 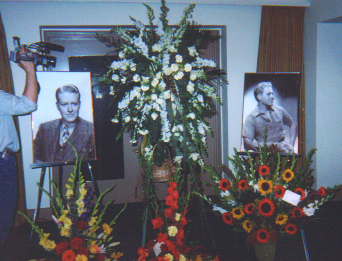 I am very, very proud and pleased at this wonderful tribute for Nelson Eddy. For those who couldn’t attend, here are the highlights. A street was named for Nelson at Hollywood Forever Cemetery. I want to thank everyone who donated both for the street sign and for the flowers. We were able not only to buy a huge, colorful bouquet on behalf of the club (the banner read: With love, the Mac/Eddy Club), but smaller flower arrangements for each table and food for the reception! The event began about noon near the street sign, which was beautifully made by Paramount Studios. The weather was beautiful, a little warm perhaps, but the sky was clear and blue. There were some introductory words by the President of Hollywood Forever, Tyler Cassidy and Finance Director Andy Martinez on behalf of the cemetery, and then I was asked to unveil the sign. Before doing so, I took a moment to thank Helen Browne, our club member who brought the Nelson Eddy Drive project to me in the first place. After Helen initially briefed me on the idea, I agreed to have Linda Foster speak at our club meeting, and thus the project began. The sign was too high for me to reach, so with the help of a cane and Tyler Cassidy, we were able to remove the cloth and reveal the sign. 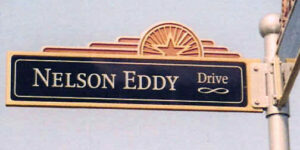 Nelson Eddy Drive is a long street and there are actually two signs in the cemetery to mark it. Above: Here I am at the unveiling. From there the group moved to Nelson’s gravesite. I had chosen three people to speak. First, Frank Laric read Nelson Eddy’s published Philosophy of Life. He then discussed the Nelson he knew, both from working with him on Northwest Outpost and from speaking with him while both were studying at with voice teacher Herbert Wall after WWII. 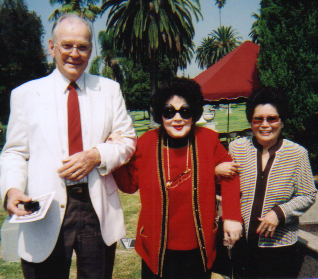 Frank, as you may recall, is one of our very first club members, who also attended one of Nelson’s concerts at which Jeanette made a surprise appearance. Next speaker was screenwriter Judy Burns, who read a short parable by Nelson. She spoke about meeting Nelson as a teenaged fan; she knocked on his front door and Nelson invited her in to chat for a few minutes! Finally, Linda Tolman read a particularly appropriate poem, “My Song” by Rabindranath Tagore. Some of you may have known Linda’s mother, Jean Reed, another longtime member of our club. All the speakers that day, both at gravesite and later in the chapel, agreed that Nelson was a gentleman, and a kindly person. 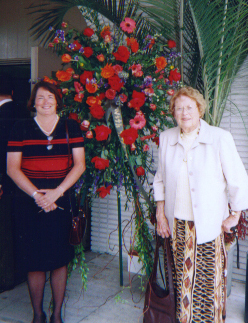 Above left: Linda Tolman and Madeline Bayless standing in front of the Mac/Eddy Club flower arrangement. Above right: A beautiful white flower arrangement from the NEAS, flanked by two poster-sized portraits of Nelson. There were two guest speakers courtesy of the NEAS, Kathryn Grayson and John Paton, a voice professor at USC. Miss Grayson spoke of the impact of Nelson and Jeanette while Mr. Paton gave an interesting and perceptive overview of Nelson’s concert career. Awards were given to Perry Pickering, head of the NEAS. 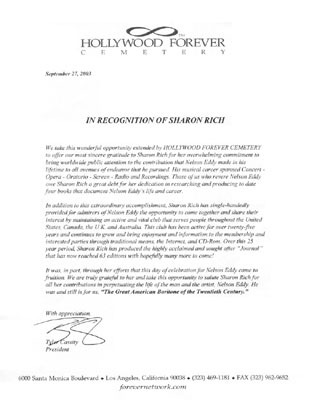 He wasn’t present but Diane Flaherty accepted on his behalf. Diane, by the way, put in a tremendous amount of work towards pulling this event together and she also provided the programs. Then Rachanee Clovis accepted her award for donating the final monies needed to finish the fundraising project. I remember the first Mac/Eddy Club meeting that Rachanee attended; it was in Washington, D.C. in May 2002, and she was fairly new to our club. Rachanee pulled me aside and told me she wished she could help with Nelson Eddy Drive in a big way. Who knew then that this would actually occur? I also received an award and then thanked everyone from the various clubs for putting aside differences to make the project happen, and also commented that there were certainly no more devoted and passionate fans than those of Nelson and Jeanette! Linda Foster spoke emotionally about Helen Browne’s contribution; Linda herself is also to be highly commended for seeing a sometimes difficult project through to the end. Thank you, Linda! 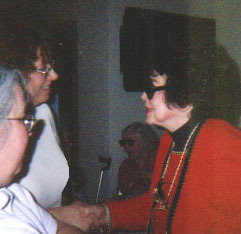 Annette Lloyd presented the revised Nelson Eddy video biography. She had changed a few things and added a bit to the latter section of it, including some very sophisticated video effects with photographs. I think everyone will be very pleased with the final product; thank you, Annette! With Nelson’s voice singing in the background, we then enjoyed sandwiches, vegetable and fruit platters, champagne and bubbly apple cider. We then left the cemetery and returned to the Hollywood Roosevelt Hotel, where our “Meet and Greet” soon began. K.T. Ernshaw and I answered questions and signed books. Our reception, which was supposed to run from 5-7 pm, actually didn’t break up until 10 pm! By that time, we were all starving so I joined the group as we trekked up the street to a local pizza joint! The next morning, a good-sized group of people met in the lobby, ready for the driving tour. We took a few minutes to get everyone who needed a ride assigned to a car, then we drove in procession through Hollywood, Beverly Hills, Brentwood and Pacific Palisades, visiting most of the homes lived in by Nelson and Jeanette. The most popular site was Mists, judging from the cheers when I announced that as the next stop on the tour! One of our members had done extensive research on history of the house; I read it aloud as everyone got out of their cars to survey the area and take lots of pictures. Above left: I’m standing on Angelo Drive, reading aloud about the house known as Mists. Above right: one of the views of Los Angeles from high atop “Misty Mountain;” you can see why Nelson nicknamed the house as he did. People were also interested in the house that Nelson built on Halvern (that he later sold to Fred MacMurray). The question was brought up as to why a family-sized house had been designed after Nelson’s marriage to Ann Franklin, since they never had children together. (MacMurray and wife June Haver raised their twin daughters in this house.) K.T. Ernshaw, who joined us on the tour, answered the question for us. She stated that Nelson had purchased the empty lot and had the plans drawn up much earlier than the marriage to Ann. He had talked about moving Jeanette into it and raising a family with her after they married. Of course this didn’t come about, so after he married Ann, Nelson went ahead with the building of that house anyway. It was finished in 1940 and Nelson sold it in 1946. It was pointed out that Nelson also bought the lot on Ashdale Place before that home was built. Ashdale at that time was a new development area, and Nelson bought in before the area was too crowded. Nelson owned/rented/leased many houses due to the fact that he had to move frequently during his heyday. While we were parked at 703 N. Alpine Drive, where Nelson moved to after the release of Naughty Marietta in 1935, Marian Skidmore commented that she had visited this location back when, on two occasions as a young fan. One time she saw Isabel walking Sheba down the street (Nelson’s dog given to him by Jeanette). Another time, Nelson came out of the house, saw his fans waiting for him and quickly made his escape! So I learned some new information on the driving tour along with everyone else! People enjoyed the tour, although some didn’t realize Nelson had so many homes! We ended up at the Paradise Cove Beach Cafe (the former Sandcastle). It’s a popular restaurant but far more informal and busy than when I used to eat there with Jeanette’s sister Blossom in the 1970s. (I assume it was more exclusive when Nelson and Jeanette ate there.) This restaurant and nearby beach has been the site of many films, plus in the TV series “The Rockford Files,” Jim Rockford’s beach-side trailer home was parked right behind the restaurant. It was late in the afternoon when we left the restaurant. Over the course of the weekend, I was glad to be able to catch up with some old friends, plus I made new friends. Most of all, I’m grateful that the tribute to Nelson went off so beautifully. More details to follow in the upcoming journal. If you would like to write in your comments about the weekend, please do so. We’ll try to include as many as possible. Note: You can click on the Hollywood Forever award to the right to read it; clicking on the zoom icon that pops up will allow you to see it full size. The complete article can be found in Mac/Eddy Today, Issue #64.